I didn’t think much of organic food when I first heard about it, thinking it was just for treehuggers or my sandal-lovin pals in Saanich. I was mistaken. It’s what REAL food should taste like but doesn’t when it comes out of a microwave pouch from Mr. Chef-Boy-Ah-Gotta-Barf. 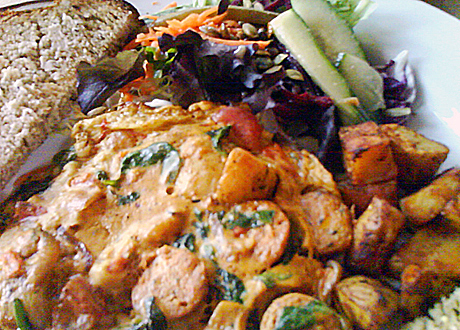 My new favorite spot for delicious organic fare is Aphrodite’s Café on West 4th off Dunbar. We found it by accident after going to Forerunners too early and deciding to kill time with some pie, my favorite food group. (Aphrodite’s Pies is where they spun off from, just next door. Also organic ingredients, a bit on the sweet side.) Both times that I’ve enjoyed Sunday brunch have been flavorfully orgasmic, like I’m eating freshly picked from the farm. They have a generously large menu with additional seasonal specials from an organic farm where unique combinations are born (including elk, chorizo, italian herb, or butter chicken sausage). Their multigrain toast is made from fresh bread baked in the back, home fries are perfectly cooked and seasoned, fresh fruit waffles are very popular and their salads are chock full of seeds, carrots, cucumber and numerous greens on a tasty dressing. We used to hit Sophie’s for brunch, but I think we’d prefer to venture further west for something mighty healthy and delish. ps. The ketchup is also organic. A café after my own heart. Snif! To add to Ben’s questions tonight, the restaurant fills the original bakery on the left side and the cafe on the right. They have a mix of couples, families, and big parties dining. I don’t recall seeing tons of kids but they do welcome babies and toddlers, and we do fine with our 4 yr old. Freshly baked muffins, waffles and typical breakfast fare are available for brunch but I also hear the dinner menus are pretty incredible (we haven’t gone yet).